Cat owners know: Getting a feline to swallow a pill can be a challenge. In fact, it might be one of the biggest challenges when it comes to cat care. Finding a way to give your cat medication in a low-stress manner is crucial to her health. Fortunately, there are some simple strategies for camouflaging medication in food and treats. One word of caution: Certain medications may be compromised if they are cut, crushed or mixed with food. Before incorporating any of these tips, talk to your veterinarian. Get your cat accustomed to eating a variety of foods. Assuming your cat doesn’t have a medical condition that requires a specific diet, introducing a variety of cat foods over time can make it easier to find treats and soft foods ideal for disguising pills. One way to diversify your cat’s palate is to place a very small amount of the new cat-safe food in her bowl with her normal food, or to serve the new food at the same time but in a separate bowl. Monitor the cat’s intake so you can tell which food, and how much of it, she is eating. 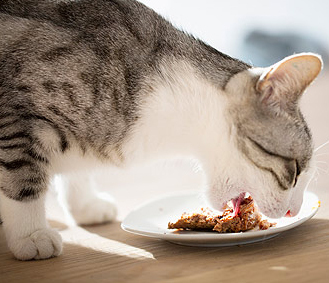 Repeated exposure can encourage your cat to tolerate — and even enjoy — different foods. Be aware that introducing new foods can cause stomach upset, so if you notice any vomiting or diarrhea, discontinue the new food and call your veterinarian. Use the right treat and the right approach. I have had the best luck hiding pills in treats that have a strong taste and flavor and that can be molded around the edges of the pill to completely cover it. To eliminate any trace of medicine on the outside of the treat, use one hand to fill and the other hand to seal the treat. Try the three-treat trick. This is a go-to method for many veterinary offices. The first treat is empty of medicine; the second contains the well-concealed medicine. The third treat encourages the cat to finish the medicine treat so she can get one more nibble. All three treats should look alike and should be given in a similar manner to hopefully prevent the cat from guessing which contains the pill. The number of treats can be changed if needed — if the cat needs more than one pill, for example, or just needs a little extra coaxing. Cut it into pieces. Ideally, your cat’s pills will be small enough that they can be swallowed whole. If the pill is too large to swallow, talk with your veterinarian about using a pill cutter to break it into smaller pieces; divide those pieces into as many swallowable treats as needed. Crush it. Some pills can be crushed, but talk with your veterinarian before you go this route. Be sure that the medication won’t be compromised and keep in mind that crushing a pill may release a bitter taste. If your cat’s medication can be crushed, you can conceal it in a soft binding food, such as canned cat food, or in a small amount of fish or lean meat. Another option is to dilute the crushed medication in a liquid, like low-sodium chicken broth or the water drained from a can of tuna or clams. Talk with your veterinarian about which option is best for your cat. Disguising pills in a food your cat likes is the simplest way to get your feline to take her medicine. But this approach doesn’t work in every situation; some medications are not prescribed in pill form, while others need to be taken without food. For these reasons, it is important to know how to give your cat medication by hand or with a tool like a pill gun or syringe. Start by learning how to pill a cat. The ideal time to do this is before your feline needs medication. Ask your veterinarian to show you the right way to give your cat a pill. This may sound scary, but it’s fairly simple: Hold the top of the cat’s mouth on both sides with one hand while you use the other hand to open the cat’s lower jaw and drop the medicine in. You can also use a pill gun in place of a hand, if that is easier for you and your cat. If you think your cat will bite you, ask your veterinarian to show you this method first. Change the delivery system. A dropper or syringe is another option for delivering some types of medication. This can be filled with liquid medication or crushed pills dissolved into a liquid or soft base. Practice, practice, practice. Start training your cat to take a pill as soon as possible — ideally, well before she actually needs any medication. The more practice you and your cat have, the better. Use treats in place of pills, and go slowly: In the beginning, you may need to reward her just for letting you touch her face or hold the pill gun or syringe near her mouth. To get your cat used to the syringe or pill gun, you can cover the end in a soft, spreadable treat. As with all training, follow up with a reward, either a treat or play time or a special toy. If your cat is adverse to being handled, wrapping her in a towel may make giving medicine easier for both of you. Ask about other options. Finally, consider talking to your veterinarian about alternatives to the medication your cat has been prescribed. Sometimes medications are available in forms that can be given through the skin or injected by your veterinarian. Another alternative may be to have your cat’s medication compounded by a pharmacy into a tasty liquid or a solid treat the cat will willingly take.